Marriage is almost as old as Humankind. With so much time to evolve and running through so many cultures it’s no wonder why we have so many unique wedding traditions today. We’ve gone through the history and traditions of cultures around the world to bring you the top 25 most interesting, fascinating, and weird wedding traditions. Some are still being practiced today while others have evolved to become completely unrecognizable. There’s more than a few that you’re familiar with, but there’s many more fun wedding facts from around the world that you’ve probably never even heard of. If you’re planning on dressing your bridesmaids in matching gowns or planning to wear a veil with your wedding dress, and wondering these marriage traditions got started, this is the post for you! Read on to find answers to these questions along with a few facts and stats that may surprise you. Okay so technically these aren’t exactly statistics but they sure to make you feel great and, as you can see, marriage truly is a magical and wonderful thing. It’s worthy of creating volumes of stories and legends around, and passing these amazing wedding customs and superstitions on to the next generation. Throughout the world it’s very common for a bride to take on the last name of her groom. These wedding customs were so that family lineages can be maintained and – historically – demonstrated and agreement of peace between kingdoms. However, it’s never actually been a legal requirement. Pearls are a common adornment on wedding days. But, did you know that these wedding symbols are for luck? What kind of luck is up for debate? If you’re of Italian descent, for example, pearls on your wedding day – unless they’re your birthstone – brings bad luck. If you’re Greek, however, you’ll be fending off the tears of the Gods. The practice of dusting the wedding aisle with flower petals is a fairly literal metaphor. Flower girls throw flower petals for the bride to conjure up a sweet and plentiful wedded life. Back in the times of chivalry, the groom would have to keep his sword hand free to fend off competing suitors. We suspect that this is one of those bridal traditions that have evolved over the years, which is now the practice of the officiant asking if anyone objects to the union. This is the cost of the world’s most expensive wedding dress. 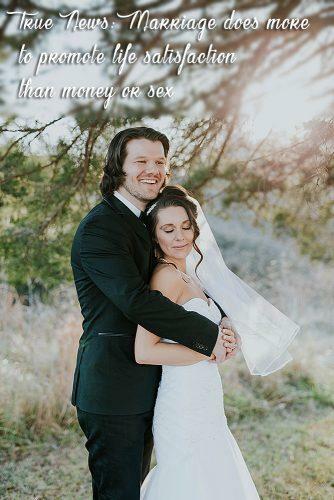 Not the wedding. The wedding dress. Martin Katz and Renee Strauss were the designers behind this gown featuring 150 carats worth of diamonds. The record setting weight of Queen Victoria’s wedding cake. 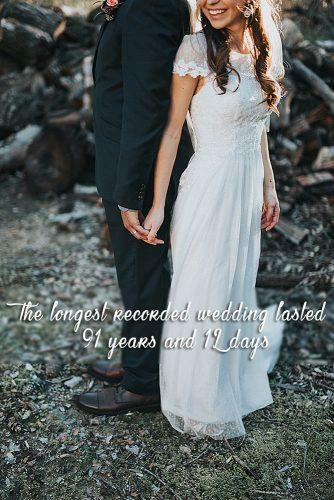 This is one of those facts about weddings that’s hard to wrap your head around, but it looks to be about 8 feet tall and reported to be 9 feet around which accounts for its weight. More impressive is the artistic detail that go into every square inch. The tradition of carrying the bride across the threshold is to protect her against evil spirits. Evil spirits seem to be a pretty common theme with weddings. Sourced back to ancient Rome, new houses were suspected to carry the angry spirits of those who inhabited the home prior to the happy new couple moving in. Carrying the bride would prevent her from tripping through the doorway and circumvent bad luck. The original translation of the word “bride” is Proto-Germanic word meaning “cook”. Not cool guys. 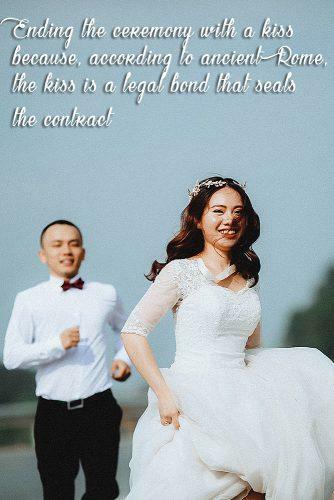 In ancient China eyebrows are considered highly attractive causing the practice of shaving the bride’s eyebrows so that other men don’t become enamored. Brides from ancient Greece believed that tucking a lump of sugar into their gown would summon good luck throughout the marriage. Some modern brides continue the superstition but prefer to stuff the sugar somewhere more comfortable like in their glove. The custom of groomsmen came about in an odd fashion. The groom, with the help of his groomsmen, would kidnap the bride and whisk her off to the altar. Although this practice became rather sweet over time, it’s believed that this originated with child brides or skipping out on bride fees. Not such a romantic start, but we got there eventually. Ancient customs, believing it would bring good luck, included tearing of a piece of the bride’s gown after the ceremony was complete. The practice continues today with the tossing of the bouquet or garter. Something Old and Something Blue are still used today, but few realize the symbolism. The first is meant to keep the couple connected with their roots and forefathers. The latter is the embodiment of love, purity, and fidelity. In many older civilizations, mostly originating from uk wedding traditions, the marriage ceremony consisted of Hand fasting, literally binding the couple’s hands together with rope. This is where we get the term. Medical science wasn’t as advanced when marriage christian wedding facts were being forged as they are today. It was commonly believed that a vein ran from the fourth finger directly to the heart, which is why it was chosen as the “ring finger”. Here’s a nice piece of wedding trivia for you! The most expensive wedding on record comes in at $44 Million!! The lucky couple tied the knot in Dubai on May 22, 1981. The Evil Eye is an ancient Middle Eastern legend of misfortune and injury. Brides adorn henna tattoos on their feet and hands to ward off the wretched curse. If you’re in a rush and want to elope in Vegas, you’d best avoid Christmas and Valentine’s Day. With more than 100,000 ceremonies each year, these are consistently the busiest. Even today, Egyptians carry the practice of pinching the bride for good luck on her wedding day. In the United States alone, 17 tons of gold are consumed to make wedding rings each year. Today’s average engagement ring costs a little more than $3500 with the most expensive on record being $8.8 Million, given to Elizabeth Taylor of course. It’s commonly believed that a bride wears a veil to present herself anew to her bride, but that’s not quite right. The real tradition started with bride’s protecting themselves against evil spirits. In creepier Roman news, brides were draped from head to toe in red sheets to make it appear they were ablaze. Why? To scare evil spirits away of course! The tradition has evolved slightly over the years. Instead of eating cake, ancient cultures broke bread – over the bride’s head – to provoke fertility. This isn’t uncommon as food plays a major role in weddings and fertility from many different cultures. The Japanese, for example, serve herring roe (fish eggs) and sushi for the same reason while Mexicans serve roasted goat. Husbands who make a habit of kissing their wives each morning has also made a habit of living longer than their prude counterparts. Five years longer in fact. Modern grooms are far more active these days with 3/4 of them participating with the gift registry selection and 40% taking an active role in wedding planning. With today’s global community varieties of wedding customs are colliding more than ever, which will no doubt bring new and exciting explanations to some of our traditions. The evolution of the story is sometimes just as, if not more, entertaining than the origin. If you’re currently planning a wedding or about to go through the ceremony and reception, take note of all of the steps you take throughout the day and ask yourself: Why do we do this? If you haven’t already seen the answer here, look it up! The answer will certainly delight you.